This Gift Pack is a great opportunity to mix things up! 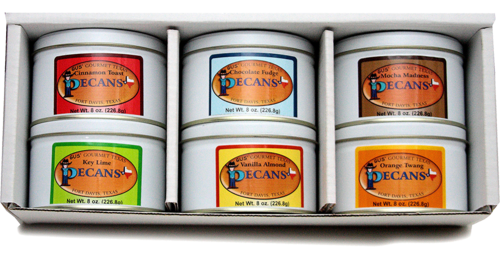 Six, half-pound tins give you an opportunity to really sample a lot of flavors with more than just a bite of each. Mix and match to your heart's content. Just let us know which 6 flavors you want. Need three Mocha Madness, one Praline, and two Sweet-N-Sassy? No problem. Want all of them to be Chocolate Fudge? Just select the six you want.